Come to Dalby, The Great Yorkshire Forest, and experience outdoor theatre in a beautiful and atmospheric natural setting. 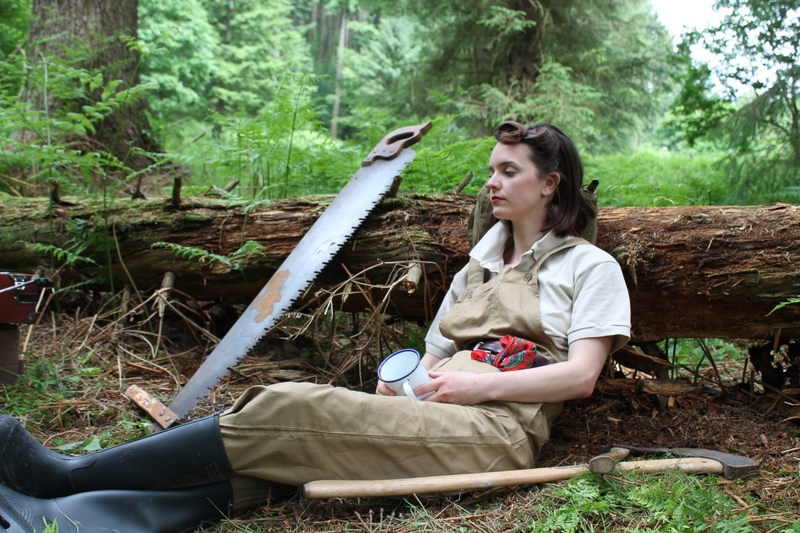 The Lumberjills takes place in a woodland glade and tells the stories of the women who worked in Britain’s forestry trade during the Second World War. We invite you to step into a 1940s world of gramophones, tree felling and tea dances. This is a poetic and dramatic celebration of the lives of the unsung heroines of the forest’s past. The Lumberjills tells the story of three young women, Mary, Connie and Ada who are called up to join the Women’s Timber Corps. Together the three friends master the art of swinging an axe, staying out late and dancing the foxtrot. Working in the forest is a tough life and the state think that it will take three women to replace every man, but in actual fact these girls are sturdier and stronger than the world gives them credit for. Working in the forest amidst the horrors of war, allows the three young women many adventures and leaves them with memories that they will treasure for the rest of their lives.